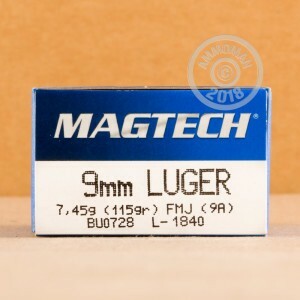 This 9mm Luger ammo, sold in an affordable bulk 1,000 round case (with 20 boxes of 50 rounds each) fires a light 115 grain full metal jacket bullet and achieves an above-average muzzle velocity of 1135 feet per second. Each cartridge uses non-corrosive Boxer primers and reloadable brass cases. 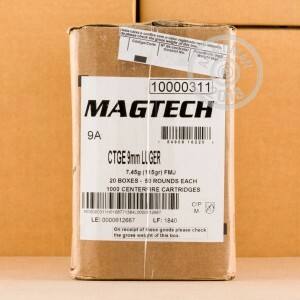 Magtech ammo is produced by CBC, a Brazilian defense contractor with nearly a century of experience producing cartridges. CBC makes its own propellants, primers, and other components to provide you with a consistent, high-quality shooting experience. AmmoMan.com ships all orders of $99 or higher for free, including most bulk ammo cases. You pay only the list price. Try it once. It will become your favorite too. Cleanest burning ammo out there. Great for practice. Verdict: Ammo cheap & good enough for the range, but you'll want to clean yo weapon afterwards. Love ammo man. You can’t go wrong with mag tech. Very clean burning. My Browning Hi-Power loves this stuff. I've shot almost all my initial 2000 round order with no mis-fires, no FTF, and if I do my part, they all hit their targets. Good stuff. Another 2000 round order will be on it's way in a couple of days. I have shot about 600 rounds and never a misfire. Loading is clean and firing is not smokey as seen in lesser quality brands. I have a Springfield xd mod.2 9mm 4" in case one asks. Will buy again soon. Thanks for great product and shipping. Have shot 50 rounds with no problems. So far a great product. Great price, only shot 100 rounds so far, with no issues. Reliable ammo quickly delivered. Top notch! No misfires or failure to feed issues. Solid range ammo. Shipped fast and really liked the discreet packaging. Have shot through multiple brands of guns. Haven't had any cycling or firing issues. Shoots clean. I have ordered 3000 of this product so far. Will order more. Nice range ammo and fast delivery recommend this ammo and ammoman. I have bought 3000 rounds of the Meg Tech, not problems. I'm shooting a Sig Sauer P229. Delivery usually with in 5 days it's coming across country. That's good time. Great service from Ammoman !!!! Can't beat this do the price. This is great ammo. I've gone through about 500 of my 1000 rounds I bought. It arrived a couple days once I ordered it. I've only had one round not fire. Killer deal for the price. Would recommend to anyone for range ammo. Ammo has performed flawlessy. Fantastic price and fast free shipping. Will definitely buy from AmmoMan.com again. Ammo Man is a great place to order from. Good prices. Fast delivery. I Have been using this ammo for a few years now. Tried a few other brands but MagTech, shoots clean and have not had ANY issues after thousands of rounds. I also use this in .40 S&W. Same result. Awesome! Go Ammo Man. Great Deal On Ammo, Qaunity- Qaulity- Price- Shipping Time. Will Be Ordering Again. Thanks, Ammoman.!!!! Good ammo and fast shipping. Superb customer assistance if needed. First time customer here. I will most certainly be back for more. Also, I am very impressed with the quick delivery and no hidden cost at checkout. Bought a few thousand rounds for target and match practice. Ordering was easy, product shipped same day, and I rec'd exactly what I ordered on multiple occasions. Keep up the great work. Ammo, so far, has been flawless. Great quality ammo, great service , received it on time as promised . Always have some concerns about shipping ammo but this came wrapped perfectly and delivered on time as agreed. Will use again. So far so good shot 600 rounds of the 1000 in a Walther PPQ. No misfires..Gun still looked clean after 500 rounds.You can not beat the free shipping. What more can I say?You can not lose on this deal. When I saw 9mm Magtech 115 Grain FMJ on Ammoman at a great price, I quickly ordered a 1000 round case, as I know supplies go fast. This ammo has been hard to find locally, and when available, it is at a much higher price. Shipment was delivered right on schedule. I use this ammo for local indoor range practice. decent ammo for the price, i'll order again. I did have 2 misfires out of 1000 rnds. using glock 17. shipping has always been great! Though I haven't crono'd them they feel like they are higher than 130 power factor. Still, great price for club match ammo. About the same as I'm paying for Blazer Aluminum. Great service and great shipping! Will definitely use ammoman again! Shot 50 of these through my Glock 23 with a lone wolf .40 to 9 conversion barrel. No FTE, FTF, or other malfunctions while shooting fast or slow. The best part is that they all ejected between 1 and 4 o'clock. I can only say that about one other brand I tested. I shoot the .40 magtechs too. Will be buying a couple thousand more here soon. 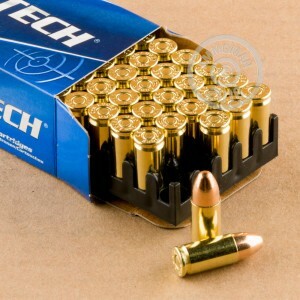 Magtech ammo is a great product. 2 day shipping for free!!! Best place for ammo!!! Great deal. Lots of online places have good prices, then the shipping kills the deal. Ammoman rules. Have already referred to my friends. No problems at all... Fast shipping Ammoman is the place to go. This is my 3rd Case of Magtech 9mm. Shoots clean,no FTF's or FTE's. Had some Blazer CCI aluminum cases split as a reminder to stick with Magtech. Like the new,larger 50 count boxes,more room between the rounds helps the reloading process a lot. Fast shipping and good price from AMMOMAN . I like the double shipping box option !! Recomend this product with 0 reservations.